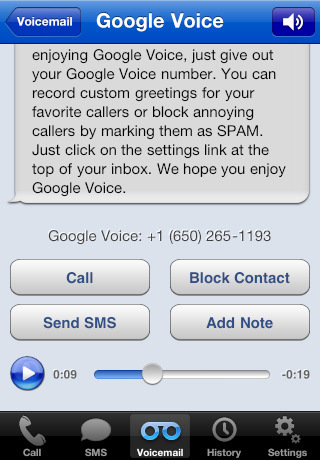 Google Voice has finally come to iPhone. After months of going back and forth with Apple, developers have finally gotten the chance to bring their Google Voice applications to iTunes. GV Connect is one of those apps. It’s a fast G-Voice client that helps you save money and get the most out of G-Voice on your phone. GV Connect has a very intuitive interface and can save you a lot of headaches on the go. 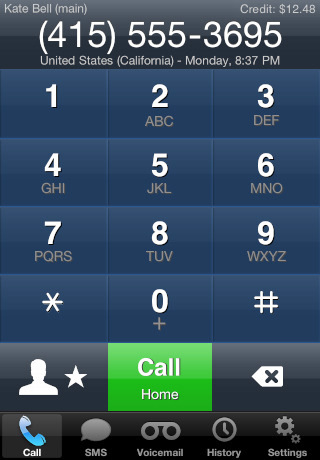 You can send and receive SMS messages using your Google Voice #. Messages are stored on your device, meaning that you don’t have to be connected to the Internet to review them on your device. GV Connect is designed to help you get the most out of all the features Google Voice has to offer (call forwarding, message notifications, and … can be configured). As long as it is active, it can grab you latest messages from GV. If you plan to use this device on your iPad or iPod Touch, you are going to need additional apps (or a bit of hacking) to get the job done. GV Connect has a lot of potential (adding push notifications would be nice). Let’s hope Apple does not remove these types of apps in the future. This is a pretty fast Google Voice client and worth every penny.